Top notch flavorful food awaits you at Susan Feniger's Street, which features street foods from around the world, including some Indian favorites. 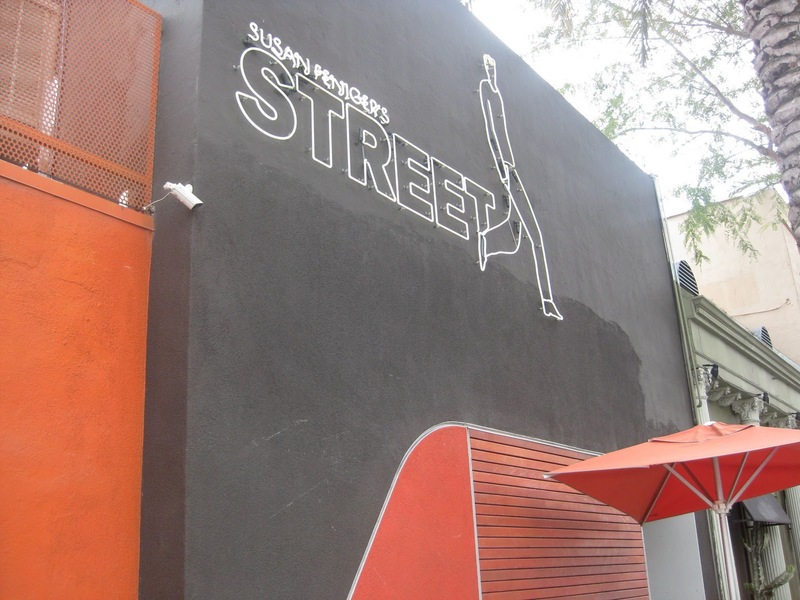 The Details: Susan Feniger's Street isn't an Indian restaurant. 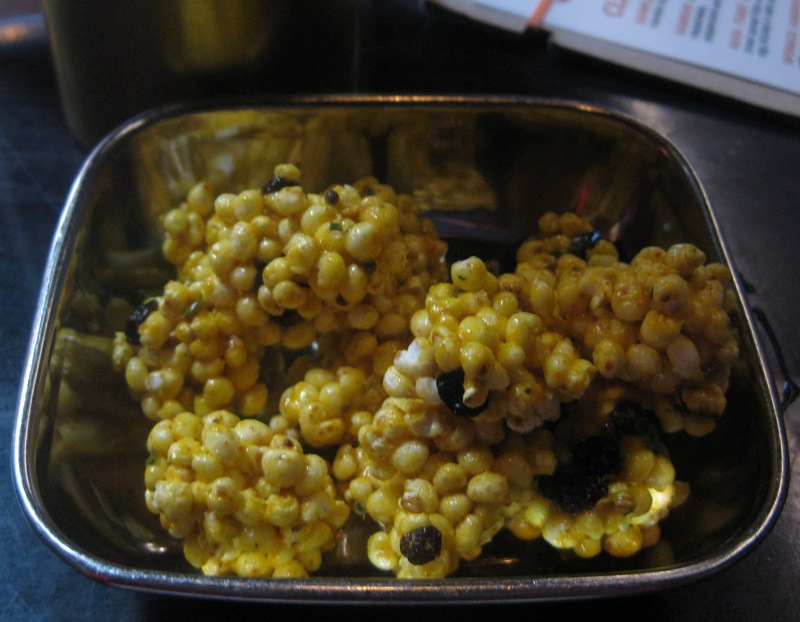 Its niche is street food from all over the globe, but Indian food is well represented. And I'd be remiss if I didn't review it for saagAHH -- my lunch here was one of the best meals I've ever had. Plus, the menu (for dinner anyway) includes Saag Paneer & Dal, and you know I'll check out any place that offers the blog's namesake dish. The restaurant was introduced to me by my friend Amishi, who's also Indian. We first tried to go about a month before this visit, but alas a private party was in progress. But even then I was impressed because Susan Feniger herself -- celebrity chef and founder of several famed restaurants -- emerged from the doors with an apology when she saw our disappointed faces. This time, we planned ahead (which as anyone who knows me knows is more my style anyway). We made a reservation for lunch. The menu slightly differs from lunch to dinner to brunch (only on Sundays, I believe). 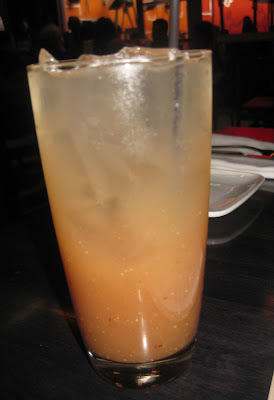 Both Amishi and I got a Tamarind Ginger Cooler for our beverage, which the menu described as "sweet and tart with homemade ginger syrup." It was literally like the beverage of my dreams -- just moments before in the car I'd been trying to come up with a recipe for a ginger-infused beverage, albeit I was thinking more along the lines of a cocktail. This drink was truly excellent. I'm sure that next time I have a stomachache (perhaps blogging-provoked) I'll be wishing I could get my hands on this beverage instead of a now-boring gingerale. The restaurant also has a Mango Lassi on its menu, and I just noticed that its brunch menu has a Indian Lime Soda on it, described as "a grown-up version of a summertime street favorite: chilled gin, fresh lime juice, celery salt, cumin." Honestly, that all sounds gross to me -- I don't like gin, plus I like my drinks sweet, not salty, but knowing my foodie curiosity I'll likely wind up ordering it just so I can take one sip and discuss its merits and flaws for the next week. Wanting to try an Indian entree, I ordered the Bhel Puri Salad. It's vegetarian and, at $8 is one of the cheapest items on the lunch menu. However, the server warned me that the portion size was small and I might want to add a side. That brought my total up to $14 (for food only), which is more typical for a lunch here. I was thankful that he mentioned the salad size, because if he hadn't I would have been annoyed when I got my food. However, with the heads-up, I was totally happy with my salad. It included sweet potatoes (yay for those instead of regular potatoes! 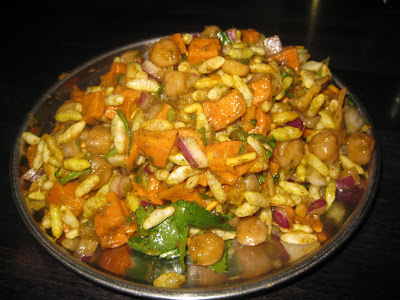 ), chickpeas, puffed rice, Indian, all mixed with a light tamarind cilantro dressing that kept it from being too dry. Amishi commented that the dish had a lot of chickpeas, as opposed to just being filled with a bunch of puffed rice. She was a bummed though that the restaurant no longer had Pani Puri, which it offered when it opened two years ago and which was featured on a Food Network show. Our server said Susan took the Pani Puri and transformed it into this salad instead. These last two items aren't Indian, but they were soo good that I have to mention them. 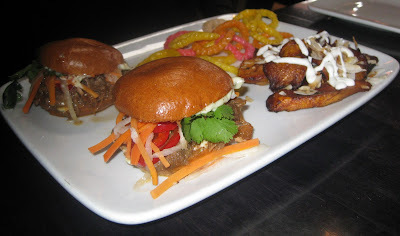 Amishi got what I would have ordered had I not gone down the Indian route: the Vietnamese Pulled Pork Sandwich. She must have seen me salivating over it, because she wound up giving me one of the two little sandwiches. (Thank you!) Street food definitely tastes better when it's shared! It was so juicy and so good -- wow. Amishi commented she could really taste the keffir lime. It was served with some plantains, which, since they had sour cream and coconut on them, Amishi said tasted "a little exotic." For that side I mentioned earlier, I got the Spaghetti Squash. This was the best thing ever. It wasn't spicy but it was seasoned with a chipotle honey butter, and if I look at this photo reminder any more I will probably short-circuit my computer with my drool. If you're a vegetable fan like I am, you must try this. It's sweet and savory all at once and delicious. Plus, the texture is terrific and the strands stay separated. (And the presentation is a little bit better than in this pic. I forgot to snap a pic before I dug into it.) Yum. Oh, and as it turns out, that first visit when we Susan was no coincidence. She's frequently at the restaurant going from table to table checking in on customers or talking to foodie tour groups. TOURific Escapes is there pretty much every Saturday. So why not the full on 10 Peppers? The food definitely is top notch, but I subtracted a pepper mostly for the parking situation. At lunch, you'll be able to find free street parking, but for dinner it's pretty much valet or bust, and I hear the valet is $8. 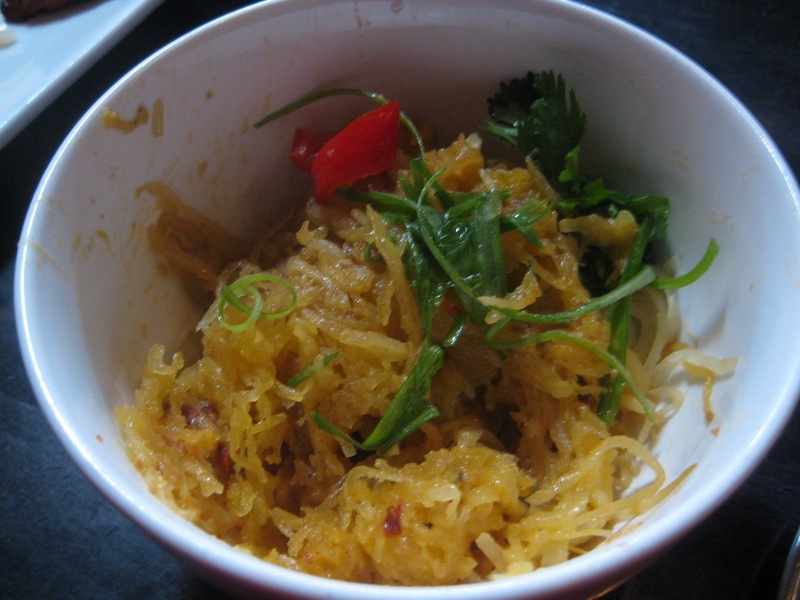 Bummer as that could have been another order of that spaghetti squash! Also, while I actually would argue that the food quality is worth the price, the small portion sizes (Amishi's sandwiches were small too) will probably turn some people off. So back to that Tamarind Ginger Cooler, what Indian-inspired cocktail or mocktail would you bring to life? Susan Feniger's Street, 742 North Highland, Los Angeles (neighborhood: Hollywood). (323) 203-0500. Funny, I was going to recommend you should go here! Consequently using every single moving past morning a lot more people are generally switching his or her concentration for you to on-line searching fake chanel coco not simply since just about every valuable object can be purchased and also really does this procedure can be far easier. replica watches uk For that reason, men and women throughout Questionnaire have in addition understood the main advantages of on-line searching and still have commenced managing the idea. chanel outlet Beginning the family unit resources including washing machines, fake chanel 2.55 indoor decor things pertaining to household similar to supplying resources, yard methods, for you to your special home, my spouse and i. electronic. apparel, equipment, replica gucci purses and handbags, sun glasses along with no matter what one particular call for can be purchased only with the just click of your respective sensitive mouse key. That they participate in for the purely natural want of most girls involving buying a Chanel handbag, obviously any good bogus one particular. An actual hublot replica sale is just about the essential equipment which a female will certainly hold using your ex while getting a gala celebration, a new video premiere or possibly a cultural celebration. This specific classy hublot replica uk best parts your cl[censored] along with cultural reputation in the man or woman holding the idea which consists of straightforwardness along with classiness. Although some people praise this current is inclined, exchanging hues because conditions advancement, writing precisely what hairdos footballers along with stars tolerate just for them to copy these people, people file to get minor desire for your moving past varieties that will proper grip catwalk along with cartier replica sale the same - nevertheless there isn't a break free. No matter whether many of us as it as well as certainly not, your outfits, sneakers, belts buckles along with equipment many of us place on depend upon a new decide on number of - people who evaluate which your dior replica will certainly offer, along with there is not any denying that will this may be a willpower primarily based absolutely on the can be 'in' there is much surprise. Officine longines replica can be drastically very happy to introduce their brand-new wristwatch - your Luminor Marina 1950 3 Days and nights.